Do you live in the Peoria area? Do you want to learn more about the Catholic faith? Do you love Fulton Sheen? 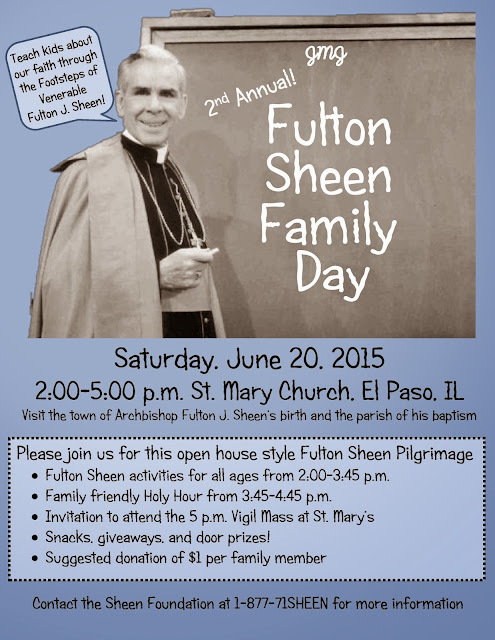 If you answered yes to any of those questions, you need to be at the Second Annual Fulton Sheen Family Day! I am helping plan it along with Bonnie of A Knotted Life, the Sheen Foundation, and St. Mary's Parish, El Paso. This fun event is open to all ages, but is especially designed for families with kids. You can read more about last year's event in this post. -Fulton Sheen activities for all ages from 2:00-3:45 p.m.
-Family friendly Holy Hour from 3:45-4:45 p.m.
-Snacks, giveaways, and door prizes! You can keep up with the details and RSVP at the Facebook Event here. If you have any questions, would like more info, or would like to volunteer or donate towards the event, please contact me in the comment box or at katherine (dot) bogner (at) gmail (dot) com.